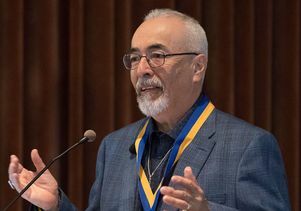 In a brief lecture, Herrera related stories of people he encountered as he traveled the country as poet laureate and of formative experiences as a UCLA student. 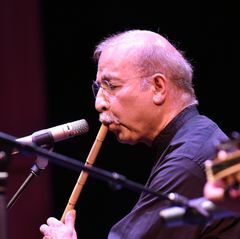 In a speech at Royce Hall that highlighted UCLA’s second annual Humanities Forum on Diversity, Race and Immigration, Juan Felipe Herrera reminisced about how the campus helped shape his worldview as an artist during the civil rights era and offered meditations on diversity. 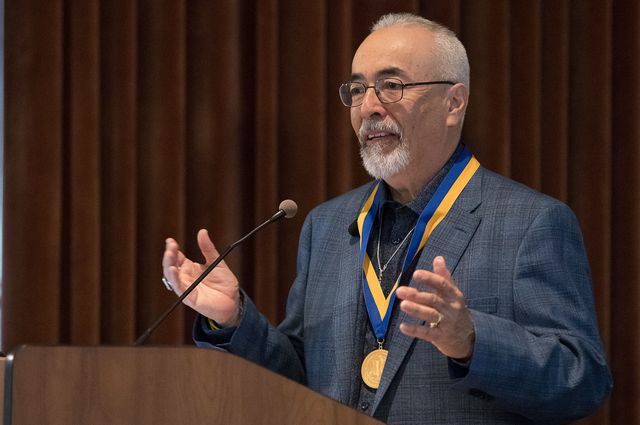 The former U.S. poet laureate returned to his alma mater Oct. 30 to accept the UCLA Medal, the campus’s highest honor. Herrera, poet laureate from 2015 through September 2017, was the first Latino person to receive that honor. He also was among the first Latino students to attend UCLA on scholarship, and he earned a bachelor’s degree in anthropology. 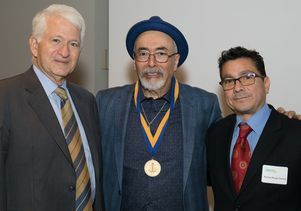 The UCLA Medal was presented by Chancellor Gene Block, who praised Herrera’s achievements as both an artist and an activist. In his talk, Herrera drew from his own experiences from different worlds, relating stories of people he encountered as he traveled the country as poet laureate. He remembered first arriving on campus in 1967 carrying what he described as “Chicano luggage” — a borrowed suitcase in one hand and a brown cardboard box tied with rope in the other — and mistakenly making his way to the hospital’s maternity ward before finally finding his new home in Hedrick Hall. 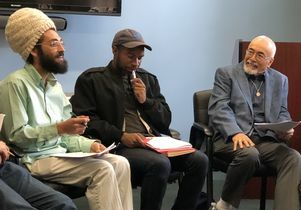 He reminisced about the jazz, experimental theater and dance performances that informed his work as a poet, and he recalled losing his voice after shouting his poetry on the hill outside of Kerckhoff Hall during a free speech rally. Prior to the medal ceremony, Herrera met with a small group of UCLA writing students in an event hosted by English professors Rafael Perez-Torres and Fred D’Aguiar. Herrera read along as the poets read aloud their own work. He praised their use of architecture and language, and offered gentle advice and encouragement. He also commended the young artists for the powerful questions they raised in their work. The humanities forum, which explores themes of diversity, race and immigration, was inaugurated in 2016, when the speaker was former UCLA professor Valerie Smith, now the president of Swarthmore College.